The outlook is rosy for those in the field of software QA engineering. Why? As long as software is being developed, a genuine need for quality assurance engineers will exist. Software must be tested, and someone must write software test cases, implement automated test scripts, and troubleshoot software issues – namely, the software QA engineer. Whether you are currently employed as a QA engineer or are looking to begin your career in the field, one of the factors you must consider is where a career in software QA engineering can take you. When can you expect promotions in this field? And how do you negotiate a new position? For some, working as a QA engineer is a sort of stepping stone to getting into the related field of software engineering. However, your career track as a software QA engineer need not veer off the path of quality assurance in order to be lucrative. Scarcity of highly qualified software QA engineers increases your value in the job market and leads to increased opportunities for promotion. A highly skilled software QA engineer may be tapped for a management position, with a chair at the strategic table of an organization. As with most career advancement pathways, advancing in the field of QA engineering is about having the right skill set and the right mindset for the job. Though there are many software QA engineers who do not have a degree in computer science, software engineering, or information systems technology, the majority of QA engineers on a fast track to promotion need to have at least a bachelor’s degree in one of these fields. Some progress to a master’s degree, and others pursue a doctorate to improve their promotion opportunities. An excellent way to enhance your chances of promotion is to invest yourself fully in advanced on-the-job training. You might also consider getting a professional software quality engineer certification, which is available through the American Society for Quality (ASQ). Additional certifications enhance your value to an organization and increase your chances of promotion. While not every company requires all of these skills, the more knowledge you have in your specific niche, the more likely you are to get the promotion you want. Top companies for software QA engineers include: Google, Microsoft, Apple, Yahoo!, and Amazon. A quick look at QA engineer and Senior QA engineer positions reveals basic salary trends, average time to promotion, and skills needed at each level. As you examine the following data, you will note that salaries and time to promotion can vary significantly from company to company. Because of these variations, you will need to consider which factors are most important for your overall professional and personal goals. For instance, if initial salary is your primary concern, Google and Microsoft take the top spots. On the other hand, if you are interested in a quick path to promotion, Yahoo! and Amazon may be the better choices. QA Engineers: Based on 260 profiles, the average base salary for Google QA engineers is $111K per year. The average market salary is $227K per year, which includes $111K base salary, $24.3K annual bonus, $25K signing bonus and $68.1K annual equity. 86 percent of Google QA engineers need a bachelor’s degree and 5 percent need a master’s degree. Top skills needed are: Scrum, Python, Test Planning, Automated Testing, and Software Engineering. Average time to promotion is 3 years. 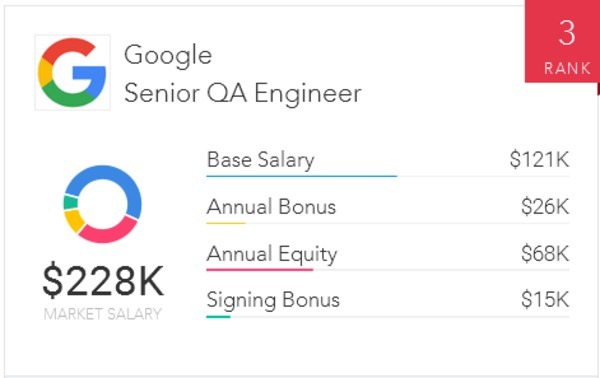 Senior QA Engineers: The average base salary for Google senior QA engineers is $121K per year. The average market salary is $228K per year, which includes $121K base salary, $25.5K annual bonus, $15.5K signing bonus and $67.9K annual equity. 47 percent of Google senior QA engineers need a bachelor’s degree and 27 percent need a master’s degree. Top skills needed are: Test Planning, Test Automation, Testing, and Agile Methodologies. Average time to promotion is 3.2 years. QA Engineers: Based on 100 profiles, the average base salary for Amazon QA engineers is $120K per year. The average market salary is $212K per year, which includes $120K base salary, $26.1K annual bonus, $37.3K signing bonus and $38.5K annual equity. 53 percent of Amazon QA engineers need a bachelor’s degree, 9 percent need a master’s degree, and 7 percent need a doctorate. Top skills needed include: Testing, Test Automation, Agile Methodologies, and Java. Average time to promotion is 2.6 years. Senior QA Engineers: The average base salary for Amazon senior QA engineers is $140K per year. The average market salary is $232K per year, which includes $140K base salary, $28.8K annual bonus, $26.8K signing bonus and $41.6K annual equity. 50 percent of Amazon senior QA engineers need a bachelor’s degree and 20 percent need a master’s degree. Top skills needed are: Quality Assurance, Test Automation, Testing, Scrum, and SQL. Average time to promotion is 2.8 years. 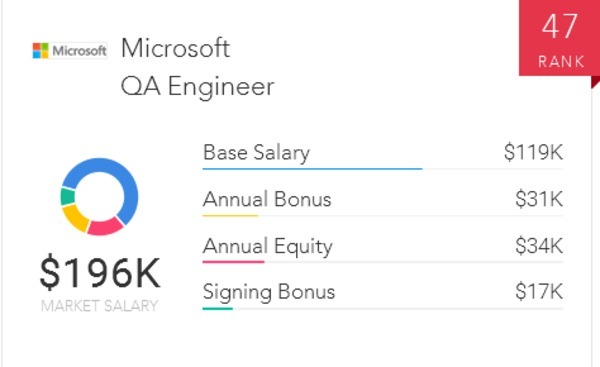 QA Engineers: Based on 49 profiles, the average base salary for Microsoft QA engineers is $119K per year. The average market salary is $196K per year, which includes $119K base salary, $30.6K annual bonus, $16.5K signing bonus and $34K annual equity. 37 percent of Microsoft QA engineers need a bachelor’s degree and 9 percent need a master’s degree. Top skills needed include: Agile Methodologies, Quality Assurance, Testing, and SQL. Average time to promotion is 3.1 years. 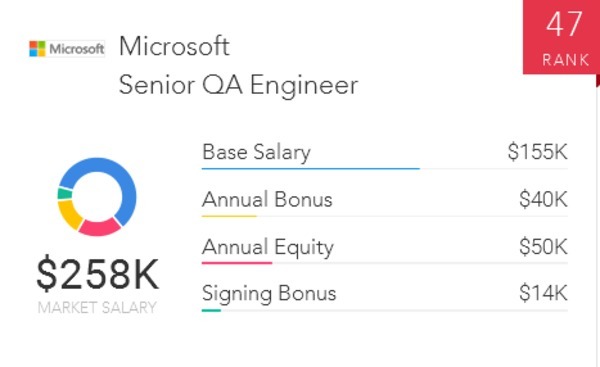 Senior QA Engineers: The average base salary for Microsoft senior QA engineers is $155K per year. The average market salary is $258K per year, which includes $155K base salary, $39.6K annual bonus, $14.1K signing bonus and $50K annual equity. 62 percent of Microsoft senior QA engineers need a bachelor’s degree and 54 percent need a master’s degree. Top skills needed include: Testing, Test Automation, SQA, and Software Engineering. Average time to promotion is 3.4 years. QA Engineers: Based on 220 profiles, the average base salary for Apple QA engineers is $117K per year. The average market salary is $191K per year, which includes $117K base salary, $19.7K annual bonus, $26.4K signing bonus and $28.2K annual equity. 51 percent of Apple QA engineers need a bachelor’s degree, 11 percent need a master’s degree, and 2 percent need a doctorate. Top skills needed include: Testing, Quality Assurance, and Test Planning. Average time to promotion is 3.3 years. Senior QA Engineers: Based on 26 profiles, the average base salary for Apple senior QA engineers is $139K per year. The average market salary is $216K per year, which includes $139K base salary, $22.9K annual bonus, $19K signing bonus and $35.9K annual equity. 54 percent of Apple senior QA engineers need a bachelor’s degree and 28 percent need a master’s degree. Top skills needed include: Quality Assurance, Test Planning, Testing, Agile Methodologies, and Test Automation. Average time to promotion is 3.5 years. QA Engineers: Based on 44 profiles, the average base salary for Yahoo! QA engineers is $99.1K per year. The average market salary is $151K per year, which includes $99.1K base salary, $16.3K annual bonus, $16.1K signing bonus and $20K annual equity. 60 percent of Yahoo! QA engineers need a bachelor’s degree, 23 percent need a master’s degree, and 1 percent needs a doctorate. Top skills needed include: Quality Assurance, Selenium, Testing, Test Automation, and Java. Average time to promotion is 2.2 years. Senior QA Engineers: Based on 32 profiles, the average base salary for Yahoo! senior QA engineers is $118K per year. The average market salary is $177K per year, which includes $118K base salary, $19.4K annual bonus, $11K signing bonus and $28.7K annual equity. 50 percent of Yahoo! senior QA engineers need a bachelor’s degree and 23 percent need a master’s degree. Top skills needed include: Java, Test Automation, Selenium, Quality Assurance, and Agile Methodologies. Average time to promotion is 2.4 years. Whether you are just entering the field or are being considered for promotion, it is important to understand your real worth in the marketplace. Paysa gathers employment data including salary, skill prerequisites, and educational requirements from top tech companies so that you can evaluate a job offer and engage in a data-driven negotiation process. Take a moment today to sign up to personalize Paysa for you.